I’ve been promising to visit a traditional Viennese Coffee House so that I can report about it on my blog for a while and if you live in Europe, you will know that the European Football Championships (soccer to North Americans) are being hosted by Austria together with Switzerland and I thought that if any of my readers where in Vienna, they could visit some traditional Viennese coffee houses. To help you, I chose a very authentic cafe, famous for cakes, the Cafe Demel. It is near the Hofburg Palace, situated on Kohlmarkt, which now resembles Saks Fifth Avenue (New York) or New Bond Street (London, UK), next to shops like Armani, Chanel, Louis Vitton and Tiffanys. 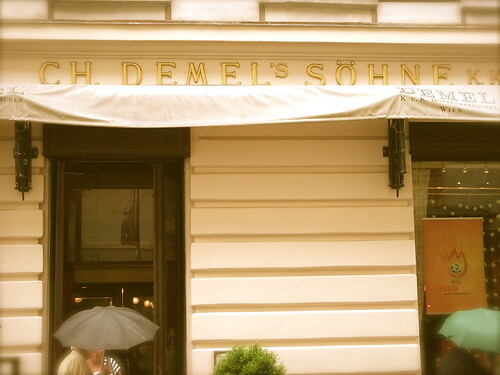 Cafe Demel is famous because it was often visited by royalty and in keeping with tradition, even today, whenever dignitaries visit Vienna, a lot of them get taken to Demel to have a coffee or at least to buy a famous Viennese cake. For example, when the former United Nations Secretary General, Kofi Annan visited, Cafe Demel made a cake that looked just like him, at least from shoulder up.As you enter the shop, there’s a display of souvenir cakes on your left and on the right and in front of you, an impressive display of very traditional Viennese cakes and pastries. As you make your way to the back, the traditional atrium has been converted into an open display area, separating you from pastry chefs decorating cakes – you are allowed to take pictures as long as he flash is off. I made my way upstairs as the lunchtime crowd had already taken up all the best seats downstairs. The interior looks like it hasn’t been touched since the turn of the last century, but that adds to the character. The regular customers I spotted in there were all into the typical Viennese tradition of ordering a coffee and reading a newspaper. as you know, if you have been through my website under “did you know”, you will know that cafes in Vienna were the first ones to introduce newspapers on sticks.Anyway Cafe Demel is now a must-stop on the Vienna tourist trail, so I was not surprised to hear lots of American and British accents. I am also happy to report that the waitresses spoke English and more importantly, where very polite, contrary to the infamous Viennese reputation of unpleasant waitresses. 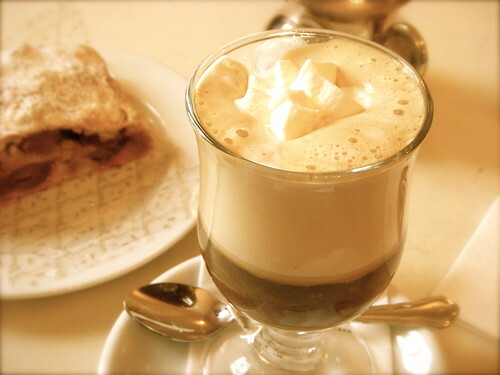 I had a very traditional Viennese coffee, called an Einspanner, which s basically like an Austrian version of an espresso topped with lots of thickly whipped cream. To accompany my very Viennese Coffee House experience, I ordered another traditional Viennese dessert, a cherry and apple strudel. All in all it was a good experience, something to be done at least once if and when you visit Vienna and I must confess, this is my first visit to a traditional Viennese coffee shop since I moved to Vienna almost 6 years ago. This entry was posted on Tuesday, June 17th, 2008 at 10:44 pm	and posted in Bean There - Cafes. You can follow any responses to this entry through the RSS 2.0 feed.